a matching bath in a bag, and one matching soap! Our body lotion is intensive and healing, and is offered in a convenient 8 -oz. squeeze bottle! Our bath in a bag will leave your skin silky and smelling great! Our all-natural soap is healing, moisturizing, and smells divine! 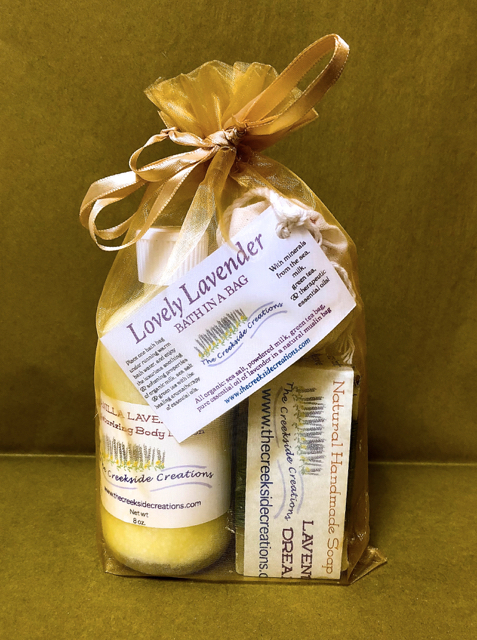 Our Lotions are rich in Witch Hazel Hydrosol, Calendula Hydrosol, Green Tea Hydrosol, Shea butter, apricot oil, evening primrose oil, jojoba oil, aloe vera and beeswax. This texture will slide on the body with no resistance or clumping! Our Bath Bags are made with specific botanicals, essential oils, and organic teas. Just drop one in your bath water as you are running the water, and step into delight! The Contents are contained in a muslin bag made with organic cotton. (As an added and wonderful use, put your bath in a bag in in a drawer or hang it in a closet for a wonderful linen sachet until ready to enjoy your bath)! Our All-Natural Soap is made by the cold-process method: Each lovely bar takes 4 -6 weeks to cure into a delightful, scent-ual, and long-lasting quality soap that is perfect for all skin types! Click the button below to add the Bath and Lotion Gift Set to your wish list.